ATV Parts, ATV Radiator Kits, ATV Wheels Tires, ATV Suspension Springs Shocks Bumpers - Wild Boar ATV Parts > Bumpers > Wild Boar ATV Parts Can-am Defender HD10/ HD8/ HD5 Rear Bumper All Models $200.00 FREE SHIPPING!! « Wild Boar ATV Parts Polaris Ranger Mid-Size Front Bumper $255.00 Free Shipping! Need a REAR BUMPER?! Wild Boar ATV Parts has you covered!! 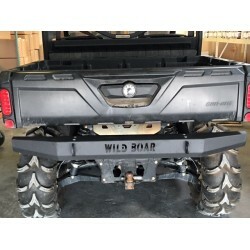 Check out our Wild Boar Rear Bumper for the Can-am Defender! Call Today at 850-912-4350 or Order Online! ​Looking to beef up your rear end or just looking for extra protection? The Wild Boar Defender rear bumper offers great protection and still allows you to keep full function of your bed. Our bumpers are proudly made in the USA, CNC formed, and powder coated for extra durability. This bumper includes 2 tow hooks that can be used to pull your friend out of those sticky situations and comes with everything you need for installation. Don’t forget to check out our matching Wild Boar Can-Am Defender Front Bumper with or without Lights.